I found this today - isn't it lovely? And it makes me think of you. 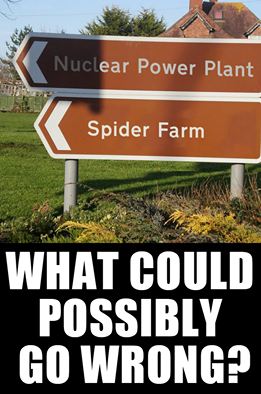 If there was a movie about a nuclear accident with spiders, you'd be the first in line for it. You've always loved those. You've seen films about mutant apes, sea creatures, ants, and I don't know what all. Spiders are inevitable. Today the societal angst is expressed in terms of zombies, not mutant animals. Every generation has its own anxieties, its own boogieman to have nightmares about. We were Cold War children; we had nuclear bomb drills at school where we learned to duck and cover. Now the crisis abroad is ISIS and the one at home is - you guessed it - Monsanto. 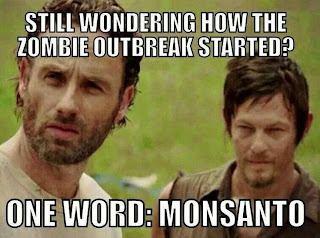 You know them; they're the people creating the zombies. I'm still not afraid of anything anymore. The thing I always feared the most has already happened. I don't know if I suddenly gained courage or perspective, or just don't care about anything. I'm leaning toward perspective. Losing you has taught me what is and isn't important. When I was little and I'd get upset about something, Mama would ask me, "Will it matter ten years from now?" Again, it's all about perspective. That's it for tonight - just musings about radioactive spiders and all those old, bad movies we watched together. When the nuclear spiders attack, I'll be sure to let you know.